WireGuard is a fast, modern, and secure VPN tunnel. This app allows users to manage and use WireGuard tunnels. The app can import new tunnels from archives and files, from QR codes, or you can create one from scratch. It is currently undergoing rapid development, and we are listening to our users in implementing new and exciting features. Please visit wireguard.com for a summary of the WireGuard protocol and how to set up your own WireGuard server for use with this app. 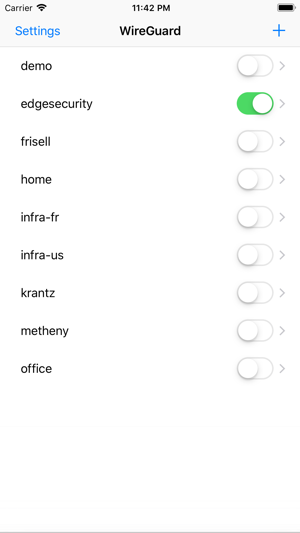 You can now select which SSIDs to use for "on-demand" mode. Multiple tunnels may be deleted at the same time. Performance improvements. Numerous bug fixes and nits. Fast, Light and Most Importantly—Stable! As proven by my own experience—Absolutely the single best app for using your WireGuard VPN protocol profiles. The connection is stable and stays connected for days to the tunnel through multiple hops on and off of cellular to and from WiFi networks. It is open source, well supported and absolutely brilliant. This is an incredible asset and wonderfully executed. To all those involved in bringing this app and WireGuard to iOS, thank you! 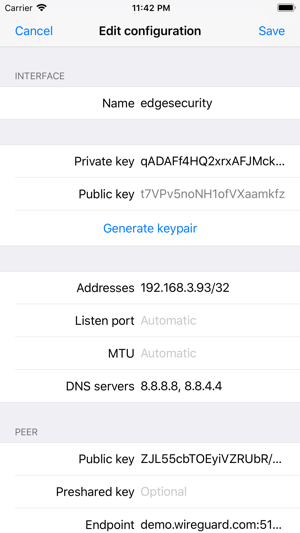 I am an advocate of using VPNs and the OpenVPN protocol and the OpenVPN Connect app for iOS, however, the release of this app changes everything. 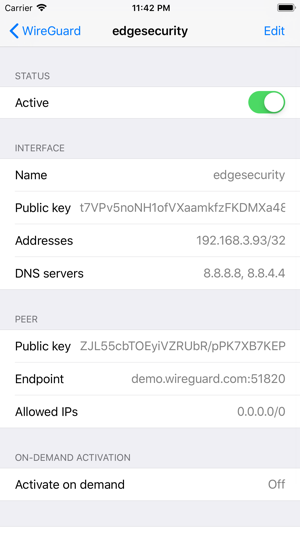 While this app is not the first WireGuard app in the AppStore, it is the only one I would ever trust—as it was created with the same transparency and openness as the WireGuard protocol itself. [UPDATE2] After two months usage I must confess I'm still impressed. With that said i do have one concern and thats excessive data usage. For the past several years ive been averaging less then 1 GB a month. Since installing wireguard my cellular data usage has exploded. Last month my cellular usage exceeded 5GB and this month its on track to exceed 7GB. Currently i have no explanation as i have not installed any new apps or changed my cellular behavior. My only recourse is to go back to Open VPN and see if my data usage goes back to normal. [UPDATE] After a month of usage i must confess this app & protocol has exceeded all my expectations. To date It has NEVER failed to smoothly transition between wifi and cellular. Ive never had to reboot and performance is predictable based on which VPN server i choose. Im now so confident of its ability i finally removed my OpenVPN client. As a long term (2+ years) OpenVPN user i must confess i tired of all the issues related to transitioning between cellular & wifi. Those days are now in the past. Simple, reliable and trust worthy is what i expect of VPN software and thus far Wireguard has delivered. Thus far i am extremely impressed. This client is super solid! Very fast connect time and reliable throughout the day switching between networks. The only problem is it’s a big drain on my battery. Overnight with low battery mode on, airplane mode with WiFi enabled, it used 25% of the battery in 8 hours. Uninstalled and went back to an IPSec tunnel and battery drain was single digit percent for the same time frame.